Editor’s Note: We’re welcoming Michael back for a guest post! Check out all of his previous work on the blog from when he was a student. As a recent graduate, I’ve spent some time thinking about what else I want to be involved in either apart from or in conjunction with my career. Since beginning high school I’ve always been what some would consider an ‘over-achiever,’ but I like to take the negative spin off of myself and reduce it to just ‘achiever’ (see StrengthsQuest). Achiever has always been to me the most fitting aspect of my personality as well as what I consider a valuable trait that employers strongly consider when looking for new employees. I’ve mentioned before how important these ‘extra-curricular’ activities are and how they look good on a resume, but there’s more to it that I want to address for you today. From my experience, being involved in political organizations and leadership roles both early on in high school and during college helped me develop communication and public speaking skills better than I ever could have developed from the one public speaking class I was required to take my freshman year of college. I used to be the kind of person who was deeply terrified of speaking in front of a crowd. My junior year of college I wound up giving policy recommendation and testimony to a congressional audience in Washington D.C. during an internship that required a combination of public speaking and research skills that I primarily got from being involved in extra-curricular activities such as MPIRG (Minnesota Public Interest Research Group) and SLC (Student Legislative Coalition). During my last year at UMD, I became (and am still presently) involved with the Duluth Area Chamber of Commerce College Connect program. This program matched me to a mentor in my field or area of interest who I meet with on a regular basis and attend the college connect events which involve activities such as volunteer work, networking, and professional skill development. I would strongly recommend to anyone approaching their graduation to consider joining this organization or something similar. The program and my mentor have given me some of the most direct and applicable advice and tips for post-graduation than anywhere else. This is a program that transcended my completion of my student career at UMD and has also sparked my interest in becoming a member of the Chamber in the near future to be more involved in my community. One of the things that first attracted me to certain extra-curricular activities was the opportunity to volunteer and do charitable work that helps others. Before graduating high school I was awarded a medal for volunteering 130 hours of my time to volunteer work my senior year of high school. I continued through college working in programs that raised money to help the homeless and raise awareness for other social issues such as LGBT rights and issues relating to foster youth and adopted youth. The most fulfilling part is getting to meet the people you help and hearing their stories. I learned during my time in D.C. how strong people can be and how meaningful it is to be a part of the bigger picture. I discovered I wanted to be an accountant because of my busy-minded nature, knack for number crunching, and interest in the business/economic side of life in general. I came to this conclusion based on an amalgamation of experiences all developed through extra-curricular activities that I have been a part of for years. I’ve mentioned before the importance of knowing yourself when presenting yourself during an interview and here, in this blog post, are the best tips I can give on how to get there. Still not convinced? It’s not surprising. Most people grow up to where you’re at today being told countless times the importance of school and good grades, but sometimes people forget to talk about doing more than just that. Maybe it’s because when it comes to work, many people don’t like to think of doing ‘more,’ but it is that precise reason why doing more is such an indication of ambition and drive that employers rank it one of their top reasons for offering an interview to a candidate. Doing more is an intriguing quality that anyone has the capability of achieving. Think about how easy that interview will go when you have all that experience added to your background to talk about! This strategy has helped me and countless others I know and have worked with at some point in time. 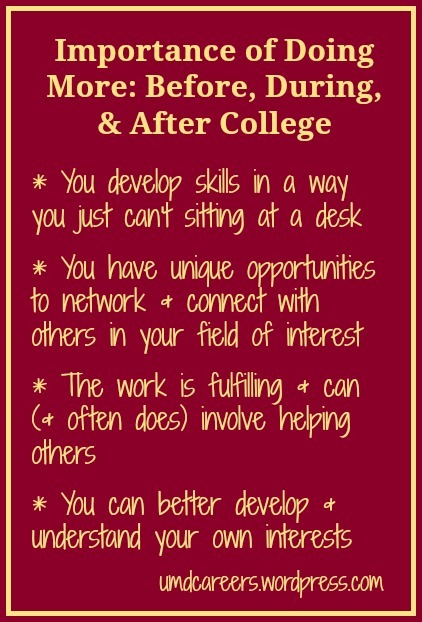 With that in mind, also know that doing more doesn’t have to end in college. Transitioning into your career or into post-graduation provides so much more opportunity at a much broader level so why not start now while you can still get your feet wet? Are you wondering about how you can do more to stand out at your current place of employment? Maybe you’re thinking about starting or managing a business and you want to know of a way to put your company in a good light. Let me introduce you to blogging! Now I know the two of you have met seeing as you’re reading this post right now, but let me tell you this; blogging is a wonderful tool that many businesses and organizations are using to develop a creative and cost-effective way to improve marketing and public relations. If you are looking for a way to stand out or increase your scope of work duties, why not inquire about writing for your company blog? Chances are, a blog does exist for your company or organization and there is also a good chance that it’s not very good due to lack of writers, neglect, or what have you. During my junior year, I had to do a market research plan for a company or industry of my choice and I had happened to select a relatively new, local brewery and began researching every aspect of their marketing strategy including their advertisements, website, and blog presence. What I noticed is that they did not have a consistent blog, oftentimes going a week or more without posting anything. It takes a lot of work to keep a blog updated on a daily basis and the more writers who contribute to it the easier it is for those who manage it. Blogs allow you to communicate to others some of the finer details of your organization that might pique the interests of your readers or create positive branding. For example, writing blog posts about different aspects of the brewing process was a wonderful topic for the brewery’s blog that led to lots of views. As most of you know, we have a lot of different contributors to our Peer Into Your Career Blog, ranging from current students to recent grads, career counselors, and some work professionals. Each blog post presents a different perspective that supports and works alongside our office’s broader focus of providing excellent career advice to our peers. What better way to do that than to get everyone who has been involved in the office to contribute their personal experiences in all things career-related? Still not convinced? Check out this article about 15 reasons why you should blog. If that’s not enough to gear you towards writing a blog, I don’t know what will. Happy writing! 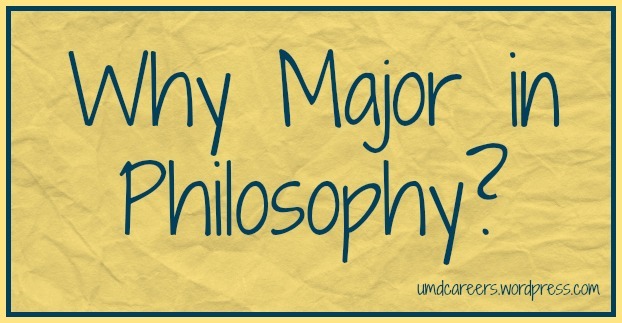 I’ve talked before about why you should consider an accounting major, but today I am going to be taking you to the other side of the collegiate fence and attempt to express the benefits and joys of obtaining a degree in philosophy. As many of you who have read in my bio know, I have a joint-degree with a major in Philosophy in addition to my Accounting major but for reasons unknown, have waited until now to talk about it. There is a lot of negative connotation in many students’ minds about majoring in philosophy with the most common concerns being that there is no explicit career path outside of academia and even then the pay is abysmal. The good news is, everything you may have heard is horribly inaccurate and you are now getting a second chance at a first impression of the philosophy field! Why did I choose Philosophy as a major? When I began my undergraduate degree at Saint Cloud State as a pre-business student, I had no idea what philosophy was beyond Aristotle, Socrates, and Plato, which I only covered at the very surface when I was in high school. I had no idea that there was an entire devotional study with seemingly endless theories about every topic imaginable and more. Part of my general education requirements included an intro course in social sciences and I chose to do a course on Ethics in Society. What I discovered in that class changed the trajectory of my college career. Although many universities like UMD do not provide a pre-law program, philosophy apparently is the next best option considering that graduates from those programs tend to score the highest on the LSAT. I was considering law school at the time until I became more involved in Accounting and chose the path of a CPA instead. I chose to complete my philosophy degree because of the opportunities for law school, the surprising amount of cross-over between the department and the business field, and because it was interesting. Analyzing and evaluating arguments is an important skill that can be used in any number of professions in which interpersonal communication is a must. Analyzing and evaluating are crucial to the decision making process, especially when that decision affects others, or relies on concerns expressed by others. Being able to interpret different perspectives can help to establish a best possible outcome. Philosophers learn early on that in order to present information on complex subjects, you need to be able to follow logical formats and be able to separate and distinguish your thoughts and ideas. This is important for critical thinking, an often sought after skill in the work force. This is important because when practicing these communication skills, you have to constantly acknowledge differences in people’s opinions and beliefs and you learn to respectfully manage conversations and handle them. Managers often have to communicate difficult decisions that others might disagree with and being able to communicate reasoning behind your decisions is a very valuable skill to have. Philosophy students tend to be more open to new ideas and differing viewpoints on life, society, and knowledge. There is never and end-of-the-line in philosophy and you learn early on that trying to find a definitive answer will only lead you down the rabbit-hole. Knowing this, you accept that others have different views and you thirst to learn more and more about the world. Want to know what all of those fields have in common? Well I will end this post on an interesting and fun fact: Every single one of those majors I listed have been covered by at least some number of philosophical ideas, debates, and theories. In Economics, you might come across Melhus’ philosophical theory of overpopulation and its effect on microeconomic resource distribution, or Hypocrites’ oath on ethical and dutiful medical practices, Descartes’ studies in analytic geometry, or William Wordsworth’s pioneering poem, The Prelude, which helped spark the Romanticist literary era in England, eventually resurfacing in American works by authors such as Walt Whitman. There is also Hobbes’ social contract theory and the justification of an authoritative government, Locke’s theory of socialism which played an integral role in the development of our constitution, and Darwin’s theory on evolution and natural selection, the list is endless. To elaborate, of the authors and theories listed above, I have studied every single one of them and more while working on my degree and knowing that, how can it be said that philosophy cannot supplement any field you choose to study? Based on this example you can see how someone’s interest in exercising and spending time outdoors can be a relevant topic of discussion for a landscaping position because of crossover attributes between the activity and job description. In this example, it can be surmised that the activity of ‘hiking, jogging, exercise’ is a good example and could be used on an application. A good rule of thumb to determine relevance is to think about whether it makes sense to describe your hobby and end with you explaining why you believe you would be a perfect candidate. Important side note: this should go without saying, do not lie about your hobbies and interests. It is much more difficult to elaborate on an activity that you have no experience with. This article further explains how to determine relevance when considering your hobbies and interests in an employment setting. Remember that having activities and hobbies is a human trait that is shared differently by everyone and that it is impossible to imagine what life would be like if hobbies did not exist. Knowing this, you should be able to identify your own hobbies in your life and begin to connect them to your work life. Where Does It Work to Network? As you may have read in my previous post about how to network, I discussed some basic tips on how to conduct yourself at your first event. Today, I’m going to talk specifically to UMD students and provide some suggestions on all of the places and events you can network at, in case some of you are still in the dark. I’m sure by now you’ve heard repeatedly how important networking is or even already heard numerous tips about how to succeed at it outside of my own advice, but once you are given that info, it seems to be that everyone expects you to find out where to go on your own from there. To prevent that, I have listed some common networking areas as well as some upcoming opportunities that I think all of you should consider when dipping your toes in the networking waters. A great upcoming opportunity to network for UMD students is the upcoming alumni networking event downtown at the Greysolon Plaza. This is a great chance to meet with other UMD graduates and gain some insight on what other students did to get to where they are today after graduation. In addition to having a bit more to relate about, this event is a little more casual and is a great time to practice networking for the first time. Although the bigger job fairs have come and gone this fall, there are still opportunities in the spring to attend. Job fairs are great for networking because it puts a large number of employers all in one spot and they are all there to talk to you students. Theses types of events can be a bit more challenging networking-wise, so I would encourage any of you to attend our workshops about job fair success and networking. A lot of companies who recruit on campus tend to have their own information sessions outside of campus. These are a great opportunity to network with employees at a specific company who you might be interested in working for. They tend to be more laid back than job fairs, with most supporting a casual environment. If you would like to get your foot in a door with a company, this is one of the first steps I recommend taking. Make sure to collect business cards, have conversations with as many people as you can, and don’t forget to follow up afterwards. Many student groups offer numerous opportunities to network with people working in particular fields or areas of interest. Groups like Management Club and Accounting Club provide many opportunities to meet recruiters and firms. Also, organizations that are more active on campus-related issues tend to have great connections to the greater Duluth community. Determine what you are interested in and consider joining some extra-curricular groups on campus, it looks great on your resume and provides lots of direct networking opportunities. Family and friends are great resources when looking to expand your network. Some of you may have heard of the 6 steps of separation and have used it to some degree. Basically the theory is that everyone in the world is connected in six or fewer degrees of separation, or that you know anyone through a friend of a friend of a friend… etc. Keeping this in mind, your networking opportunities increase massively by integrating yourself into other people’s networks as well. I have found this to be one of the most beneficial forms of networking that I have experienced to date. It is really easy to use this method to begin your networking process as you can start with familiar faces and build your way up. Start asking your friends and family about anyone they know that might be interested to talk to you about your career goals and what you are looking for in terms of employment. A meeting over coffee or lunch has always seemed appropriate for this type of networking and best of all, you have a one-on-one interaction and little distraction such as what the setting is like at a job fair. 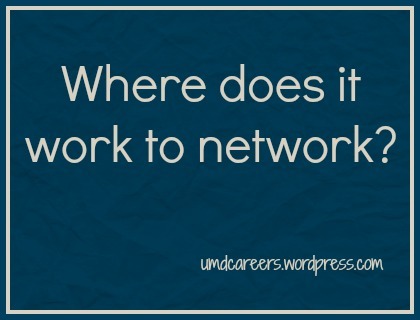 Above are just a small number of places that you can network at, but what I have to tell you is that when you really find yourself in the career world, the best professionals know and will tell you that networking never stops and that there is an opportunity for it in even the most seemingly unlikely of places. Take a look at this article and you will find that you may find connections anywhere, so building these skills early on is crucial. One thing that a lot of people, myself included, tend to forget is to exercise and eat healthy when we are busy. Most of you readers are probably just now starting to get pretty bogged down with course work and studying, but one thing I’ve learned is that the things like exercise and healthy eating that you might put off a lot now, won’t suddenly change when you graduate and begin working. It seems to be a common concern for many as I was able to see all kinds of different tips varying from health and fitness sites to business sites such as Forbes. After spending some time doing my own research, I thought it would be nice to share some of my favorite tips and factoids to maybe inspire you readers to try to be a little healthier. 1. Exercise can help reduce stress and give you more energy! I know a lot of you have probably heard this plenty of times before, but I’m here to elaborate a bit more on it. See, a lot of people tend to have this misperception that in order to be healthy, you need to go run for an hour a day. This is not necessarily the case. Most of the sites I looked at mentioned that even just going for a light 15 minute jog on a daily basis is at least enough to get you into a healthier routine without the need for over-exertion. Try to find what time works best for you; personally I’m kind of a night-owl so I like to run in the early evening, before I plan to eat dinner. Some people might prefer to work out in the early mornings before work or school. Try different times until you find one that is right for you and try to stick to that time as much as you can on a daily basis. 2. Eating healthier doesn’t have to be as long as a process as it seems! If you don’t already spend a lot of time in the kitchen, fast food or junk food often seems like an easy scapegoat during your busy life. However, foods that are high in fat and calories actually have a tendency to make you feel drowsy or ‘heavy’ throughout a long day and that’s definitely not a good feeling when you’re busy or trying to study. Instead of eating that cheese burger from McDonald’s and that energy drink from the local convenience store, try packing your own food the night before. Making a healthy turkey sandwich with lettuce and tomatoes takes only 5 minutes and you can throw in some fruits and vegetables for good measure or for something to snack on throughout the day. When preparing something for dinner, try recipes or meals that have healthy ingredients but don’t require a lot of prep time. Here is a nice website that I’ve used in the past that might help you get a good start. For your convenience, I am also attaching a good guide to help you start with your grocery shopping! 3. Getting a good night’s rest is important! I know many of you have probably gotten into the habit of cramming lots of homework and studying in to late nights, but I promise you that if you get less than the standard recommended 8 hours, adding just one extra hour of uninterrupted sleep will help you to be more efficient and productive the next day. I’ve learned this first hand and typically try to go to sleep at or around the same time every night and it really does help. Not only do you get the added productivity, but also it becomes easier to fall asleep, for all you insomniacs out there. This is a really good habit to get in to earlier on, as it becomes almost necessary post-college. Overall, these are just some general tips that I myself have been trying to follow lately. 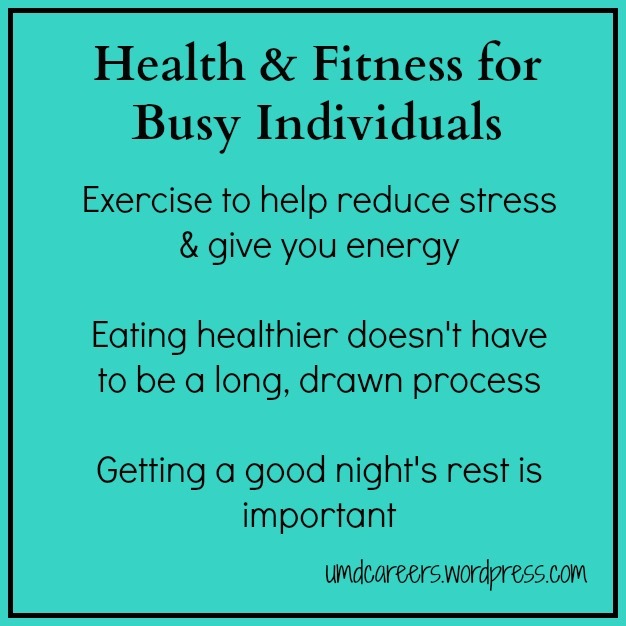 There is so much more you can do to take care of yourself during a busy lifestyle and I can try to touch on more of it if any of you readers are interested. I hope this post at least gets some of you thinking about it, as it did me whilst writing it. One of the hardest decisions I’ve had to make over the past couple of years was whether or not I would be willing to relocate or move to a different city for work. I have had my own experiences travelling, studied abroad, and interning in other cities, but I was never faced with the concept of considering a ‘permanent’ relocation. The idea was initially terrifying for me, mostly because I would be leaving all of my friends, family, and familiarities behind and trade it all for something new and unexpected. I have spent the past few weeks gathering advice and talking to friends and family about my decision to move and assembling some options for cities I’d like to move to as well as companies I’d like to work for. To help aide others in what to expect if they decide to relocate for work, I’m going to describe some of the stresses and obstacles I’m currently facing and will expect to face in the near future. Hopefully some of this insight will help prepare some of you for the future if you decide to go a similar route. 1. Resigning or rejecting offers or commitments in the town you are planning to leave. This one should seem kind of obvious, but there are some certain aspects of this that were uncomfortable for me. I had never had to turn down a job offer up to this point; it was awkward and a little nerve-wracking for me to figure out how to properly turn down a job offer. I also will at one point have to quit my current job at a bank, where I have worked for the past 2 years. I also currently bank at a local bank and will need to switch either to a larger bank or to a branch located in the city I move to. 2. Applying for jobs located in the new city. The next step I undertook was to apply for jobs. I have been submitting cover letters and resumes to a number of different accounting firms and businesses in a number of cities that I am interested in moving to. This has been a little more difficult than it seems, especially when applying to larger metropolitan areas such as Chicago, where I am unfamiliar with the area and suburbs. It is hard to know if some of the locations you are applying for are a good fit for you without doing your research, which brings me to my next point. 3. Research the Location Before Committing to Move There. I’ve been spending an extensive amount of time looking at different cities here in Minnesota as well as Iowa and Illinois. Initially I looked for cities with a significant amount of accounting positions available, compared cost of living estimates, population sizes, and crime rates (especially when looking at specific neighborhoods or suburbs). These are a few of the steps I have taken thus far. I am still waiting to begin interviewing with some of the companies that I have applied for. Once I know more about which city I am moving to, I will likely provide more insight into the ‘transitioning’ face, rather than the planning phase of relocation. In the meantime, if any of you are considering moving for work, I hope this advice helps you as much as it has helped me this semester. There really is a lot that goes in to it and right now the best thing is to take it one step at a time.